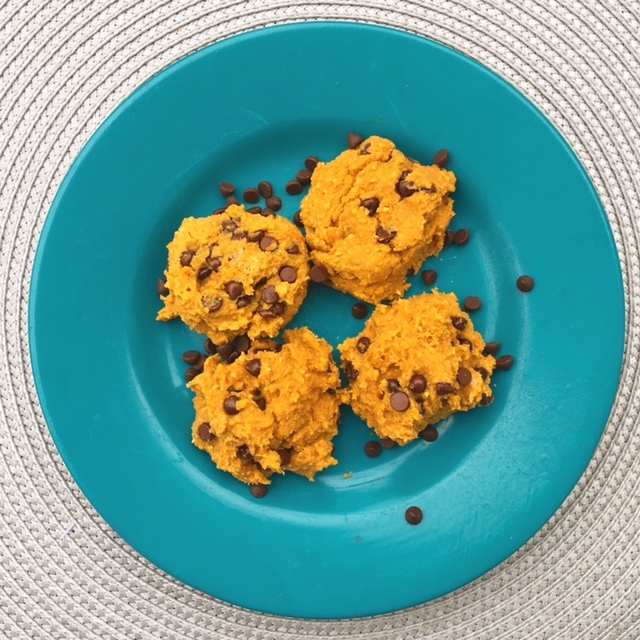 You must get your hands on this pumpkin chocolate chip cookie recipe. I mean, who doesn’t love pumpkin-everything this time of year?! Add a few chocolate chips into the mix and there’s no stopping me with these cookies. You’ll never guess what this cookie is made from…garbanzo beans. Weird, right? You won’t even know there are beans in this vegan cookie, I promise. There’s also protein powder mixed into the batter. You can use whichever product you already own, but I used an unflavored and unsweetened variety. Just keep in mind that the flavor of your protein powder could impact the taste of the final product, for better or for worse. Like most of my recipes, pulling this one together is fairly simple. Throw the ingredients to the food processor until it’s all mixed up. There’s your batter! Mix in the chocolate chips after the batter is mixed together. I used mini dark chocolate chips that are dairy free. Because of the nutritional profile of this cookie, you can also eat two of them as an on-the-go breakfast with a glass of milk or cup of yogurt. This recipe makes 12 large cookies. Grease a baking sheet and set aside. Preheat oven to 350 degrees F.
Place raw oats into food processor and blend until the oats turn to a finer consistency. Add the recipe of the ingredients into the food processor except the chocolate chips. Blend until smooth batter forms. Pour batter into a mixing bowl. Gently mix in the chocolate chips. Make 2-inch diameter cookies and drop them with a spoon onto the baking sheet. The recipe makes ~12 cookies. Bake for ~20-minutes or you can even eat the batter raw! *If your protein powder is sweetened or flavored, the recipe may have a different flavor profile. The product I used was unsweetened and unflavored with 22g protein/scoop. Stay Connected with My Latest Recipes!